Tim Tebow comeback: Reality is now indistinguishable from Tim Tebow fan fiction. Reality is now indistinguishable from Tim Tebow fan fiction. Tim Tebow and the Broncos managed yet another improbable comeback Sunday against the Bears. For the fifth time in eight weeks, Tim Tebow and his Broncos teammates heroically overcame Tim Tebow to win a game by four points or less. The Denver quarterback, who did not complete a pass in the second and third quarters, appeared for long stretches to be playing a sport in which you score points by running the greatest possible distance laterally before flinging yourself and/or the ball into the ground. With the Broncos trailing 10-0 late in the fourth quarter, the Bears permitted Tebow to throw the ball underneath, and the Denver pass catchers—who for three quarters appeared to have feet for hands—regained the opposability in their thumbs. A Tebow-to-Demaryius Thomas touchdown pass brought Chicago’s lead to three, but the timeout-less Broncos couldn’t recover the subsequent onside kick, dooming them to certain defeat. And then Marion Barber began playing the worst 10 minutes of football since Tim Tebow’s second quarter. First, the Bears running back wandered out of bounds, stopping the clock; Tebow would get the ball back with enough time to “drive” the Broncos lurchingly across the midfield stripe, “setting up” Matt Prater’s game-tying 59-yard field goal. In overtime, the ball raptured itself out of Barber’s grasp on what looked like a game-winning run, giving Tebow the opportunity to “set up” another 50-plus-yard Prater upright-splitter. Denver wins. Jesus gets another post-game thank-you note. Ever since Tebow stepped in for Kyle Orton in Week 5, the Broncos’ season has resembled Friday Night Lights, if Friday Night Lights were written by Tim LaHaye and Jerry Jenkins. In Denver’s two-part season finale, I’m expecting to see Tebow get decapitated by James Harrison in the AFC Championship game, then rise from the dead as Madonna writhes across his tomb while lip-syncing “Like a Prayer” at the Super Bowl XLVI halftime show. (This footage will later be used in the commercial that re-launches Crystal Pepsi.) The reanimated Tebow, brought on in favor of an ineffective Brady Quinn, will complete one pass for a loss of two yards, leading the Broncos to a comeback win over the previously undefeated Packers as Von Miller sacks Aaron Rodgers 14 times and Ryan Grant runs untouched into the wrong end zone for a Denver safety as time expires. 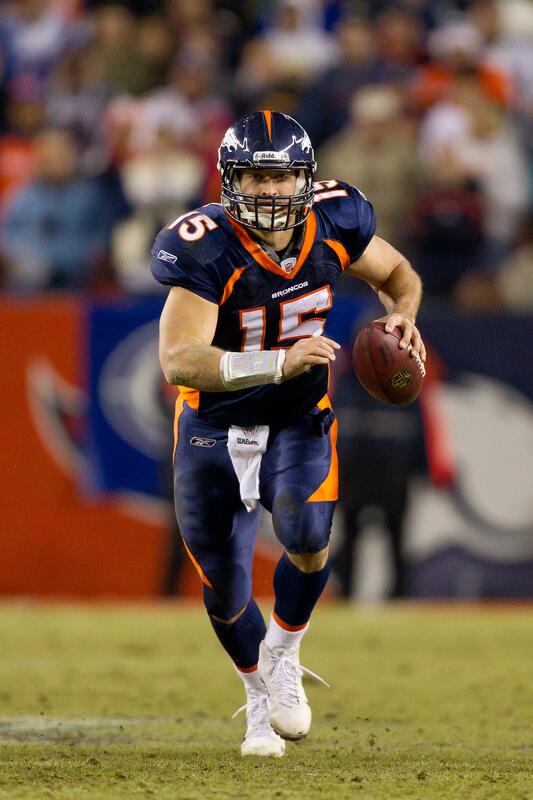 On ESPN’s First Take the next morning, Skip Bayless and Merril Hoge will debate whether Tebow is the risen Christ and if he needs to become more of a downfield passing threat for the Broncos to repeat. In six days, the Broncos will host the Patriots in a classic matchup of resistible force vs. movable object. The New England defense ranks last in the league against the pass, allowing more than 300 yards per game. But despite making the likes of Dan Orlovsky look like Dan Marino, the Patriots have won five straight games. Will they be able to keep that streak alive against a quarterback who didn’t throw for 300 yards combined in the first three games of Denver’s current six-game winning streak? If New England had drafted Tim Tebow back in 2010, he’d probably be playing strong safety this week. Over the last few months, Patriots coach Bill Belichick has released a slew of cornerbacks and safeties who’ve spent years training to play their positions and replaced them with, among others, a pair of wide receivers—Julian Edelman and Matthew Slater—who’d never practiced in the secondary. Given the statistics cited above, it would be an outright lie to say that this strategy is working. But Belichick has pulled this trick before with some success, sliding receiver Troy Brown over to defense during the Patriots’ glory years. In an age of increasing specialization across all professional sports—a time of third-down backs and LOOGYs and basketball players who shoot nothing but corner threes—the tactic is certainly intriguing. It’s a perfect expression of Belichick’s double-edged philosophy: He has complete faith in his players to be completely replaceable. The system is what matters. The main tenet of the Patriot Way is that Belichick is the one true god. It’s no coincidence that Tebow was drafted by Josh McDaniels, the Belichick disciple who led the Broncos for just short of two full seasons. More than any other NFL teams, the Pats and the Broncos are determined to win big with unskilled, fungible labor. For Belichick, it’s a matter of ego: Like many great coaches—and many delusional ones, like Charlie “Decided Schematic Advantage” Weis—he believes his X’s and O’s wizardry allows him to get by with inferior talent. For John Fox, it’s more about the uselessness of orthodoxy for a losing team. The Broncos started 1-4 with a conventional offense and they’re now 7-1 with a guy who can’t complete a 10-yard out. If it was insane to go with Tebow in the first place, it’d be even crazier for Denver to go back to playing the game the right way.